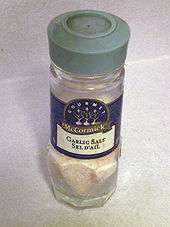 Garlic salt is a seasoned salt used as food seasoning made of a mixture of dried ground garlic and table salt with an anti-caking agent (e.g. calcium silicate). In its most basic form it is made by combining 3 parts salt and 1 part garlic powder by volume, or 6 parts salt and 1 part garlic powder by weight. It can be used as a substitute for fresh garlic, such as in dishes like burgers or chili. It should not be confused with minced garlic, granulated garlic, or garlic powder, which are just ground dried garlic, also sold as spices. ↑ Meredith, Ted (2008). The Complete Book of Garlic: A Guide for Gardeners, Growers, and Serious Cooks. Timber Press. p. 50. Retrieved 2 December 2013.